Thursday, December 18 leaders Frédéric Bonnard and Vincent Honoré met Emmanuel Macron Minister of Economy, Industry and Digital and Axelle Lemaire Secretary of State for Digital. The time of the evening they had time to introduce the product, and take a picture. 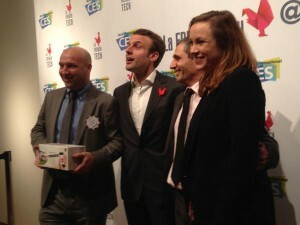 Event held at the French Tech io factory. The ministers will also be present at the CES Las Vegas 2015 and we hope to meet them again.